My pre-Christmas reading is Bob Holman's sympathetic study of Kier Hardie. 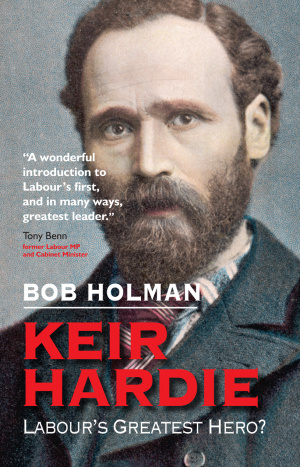 Appropriate reading for Christmas as Hardie was a Christian Socialist, something Holman emphasises in a way Caroline Benn's exhaustive study doesn't. Not that Hardie wasn't contemptuous of the hypocrisy of the wealthy Christians of his day. There is much in Kier Hardie's life that resonates today and I will select a few random examples. With the weather I have had to issue plenty of guidance on the employment issues to UNISON branches. Hardie tells the story of his first job at the age of eight delivering bread rolls for a high class bakers, because his family was ill and his the only family income. When he was late twice in bad weather he was summoned to the master's dining room (after prayers because the master was noted for his piety) and dismissed. The master said "to make you more careful in future, I have decided to fine you a week's wages. And now you may go!" This and other childhood experiences clearly had a strong influence on his political and religious views. Later as an MP he constantly criticised the continuance of poverty and inequality and, with other Labour MPs, was the driving force behind changing the Liberal Party's position on state welfare. He pointed out that charities came and went, were strong in some areas and weak in others. Something we should remember today in the context of the so called 'Big Society' reforms. When Hardie opposed a large pension for a Boer War commander and asked what was available for private soldiers coming back wounded. Tory MPs shouted back "The Workhouse". When we saw Tory MPs last October slapping each other on the back as the poorest in our society had their benefits slashed, you can see that Tory values haven't changed much. Having said that, Hardy would have been pretty damming of some aspects of the Labour Party today. He frequently warned of 'the dangers' of the Commons and the importance of Labour MPs being able, from their experience, to have empathy for working class people. He would not have been impressed with the trend towards professional politicians who have little experience of working life. Keir Hardie was a conviction politician, maybe inflexible at times, but his thinking on issues like womens rights and the environment were well ahead of his time. History has proved him right. We should acknowledge our debt to him and his ideas that remain relevant today. The recently formed Kier Hardie Society is one way of doing that and you can join by contacting Richard Leonard at GMB Scotland. Richard recently showed me round the Hardie Room at the Baird Institute in Cumnock, the town where Hardie lived most of his life and many of his papers are kept in the Institute. If you are looking for something to spend you Xmas book voucher on, I would strongly recommend Bob Holman's book. As the President of The Kier Hardie Society, Tony Benn said, "A wonderful introduction to Labour's first and in many ways, greatest leader." SNP, Tory and Liberal MSPs yesterday, sadly but predictably, turned their collective backs on violence at work and voted down the Protection of Workers Bill. Lots of apparent concern about the issue, but no action. At least the Tories have been consistent opponents of this legislative approach. It fits in well with their Westminster colleagues who are devastating the Heath & Safety Executive with 35% cuts and undermining safety at work through the Young Report. At least 20,000 workers die every year in the UK as a consequence of work, but safety is not to be taken seriously by them. The Liberals used to support this approach but have now decided to follow their UK Tory coalition partners on this as with other matters. If you read some of their replies to constituents, you would be surprised that they actually voted against. But as recent revelations in the Telegraph have shown, they share that approach in common with their Westminster colleagues. The SNP also used to support this approach, in fact they had a manifesto commitment to extend the EWA. However, they have been unwilling to extend this coverage to other workers, many of whom suffer far greater levels of violence at work. The honourable exception are those SNP backbenchers who allowed the Bill to proceed, mostly from a trade union background, who obviously have a better understanding of workplace realities. Overall we got much more rhetoric yesterday from a majority of MSPs. What the thousands of workers who daily face violence at work are looking for is action. The Scottish Futures Trust has sneaked out its annual report just before Christmas. When you read it, you can hardly blame them! The headline is that it spent £3.3m last year including more than £1m on consultants and external staff. We were told that the justification for the fabulous salaries for its leading officials, was their private sector expertise that we apparently need so badly. This includes £174,000 for the Chief Executive (part-year only), more than the Chief Executive of Scotland's largest local authority. "These figures will do little to increase public confidence in this increasingly discredited quango. Instead, they have seen the SFT pay out over £2,000 a day on consultants over the past 12 months, and today's figures prove that the gravy train keeps on rolling." There might be something to say if they actually came up with something new. Instead the Scottish Government, on the advice of the SFT, are returning to the discredited PFI model. Of course if you employ a former PFI consultant, you shouldn't be surprised if you get a one trick donkey. The Protection of Workers (S) Bill is to be debated in the Scottish Parliament tomorrow at Stage 1. The Economy Energy and Tourism Committee is recommending that Parliament should oppose the Bill, claiming it would not extend the protection currently available to workers under the common law. But, as the committee recognised, there is no statistical evidence that this approach works. UNISON believes incidents involving uniformed staff may be taken more seriously than the lower level – but just as traumatic – incidents which involve thousands of our members and fall below the radar of current criminal law provisions. Each year, thousands of dedicated staff providing vital services in our communities are being assaulted at work. Nearly 30,000 last year alone, and they are only the recorded incidents in the public sector. While legislation on its own is not enough, it is part of the solution and sends a clear message that violence against workers is unacceptable and will not be tolerated in our society. These workers deserve stronger legal protection and better protective measures and MSPs should not turn their backs on these staff. If you want to support the Bill you can send a message to your MSP through our website. 600 people have done that today alone. Well done and thanks for your support. The Sunday Herald asked me to write a comment piece on taxation for today's paper. Taxation is a subject that politicians hate to talk about. However, in the current financial crisis we need to have a grown up debate about the relationship between quality public services and the tax needed to finance them. £4.7bn could be raised every year by introducing a 50% tax rate on incomes over £100,000. £14.9bn could be raised every year by using minimum tax rates to stop reliefs being used to disproportionately subsidise incomes over £100,000. £20-30bn could be raised every year by introducing a Major Financial Transactions Tax (or "Robin Hood Tax‟) on UK financial institutions. Fair taxation also has a redistributive impact, creating a more equal society. As we know from the work by Wilkinson and others - more equal societies do better in almost every way. Parliamentary scrutiny of the Scotland Bill has started with the unusual sight of a UK Treasury minister appearing before a committee of the Scottish Parliament. One of the important gaps in the Bill is a provision that debars the Scottish Government from issuing bonds. David Gauke MP told MSPs that Holyrood could not be given the same power as local authorities to issue investment bonds because such a move could damage the UK’s credit rating. Scottish Labour MSP Peter Peacock asked why Holyrood should be denied the right to issue bonds to fund capital projects. Mr Gauke replied: “We have a concern that if the Scottish Government was also able to issue bonds there is a risk of confusion in the gilts market. We don’t want to create any uncertainty that may damage the UK’s position." This is an important issue on the day the Scottish Government published its consultation paper on Scottish Water. 'Building a Hydro Nation' sets out an ambitious vision for developing the role of Scottish Water and bonds would be one way of financing it. Given that the Scottish Conservatives and Liberal Democrats take every opportunity to undermine our public water service, I do wonder if there is any link to the UK Con-Dem minister's position on this? Interesting report from Audit Scotland today giving a financial overview of NHS Scotland. The NHS in Scotland spent £10.9bn last year, one third of the total Scottish budget and employs 160,000 people. Whilst the NHS has a degree of protection from next year's spending cuts, this report confirms our analysis that the NHS is not exempt from cuts. Funding is at best at a standstill while demand and cost pressures continue to rise. As a consequence services will have to be cut or the NHS will have to exceed its so called 'efficiency' targets - in effect the same thing. Some health boards are already balancing their budgets by using non-recurring income to meet recurring expenditure. Not a sustainable medium term financial strategy for any organisation. Boards are planning to make savings totalling £274m this year, that's £72m (36%) more than last year. With capital spending going down the prospects for savings from service redesign will be constrained. Increasing elderly population leading to more long term conditions, GP visits and pressure on acute beds. Whilst a pay freeze will reduce some staff costs the consultant and GMS contract continues to exceed allocations. Locum doctor costs have doubled since 1997. The VAT increase from January will cost NHS Scotland an additional £23.3m. PFI contracts are a fixed cost that don't reflect funding changes. They already cost £136m per year and the Scottish Government has announced a return to this wasteful method of funding. Universal service provisions including free prescriptions, personal and nursing care and eye tests have rising demand costs. Sadly, as is usual with Audit Scotland, some of their recommendations offer more of the failed top down approaches. More information should be collected, better productivity measures, shared services, leadership etc. No recognition is given to the service redesign initiatives that come from the bottom up using systems thinking principles. These are particularly effective in the NHS with its partnership industrial relations model and commitment to no compulsory redundancy. The report implicitly criticises this commitment without recognising that it is the framework that allows innovative solutions to come from staff who best understand the service. A good piece of investigative reporting in the Sunday Herald highlighted the provision of new 'Executive' cars for the Chief Constable of Strathclyde Police and his deputy. A new Audi and a BMW at a likely cost of £91,000. At the same time this force is cutting a travel scheme for displaced low paid police staffs. You couldn't make it up! In addition the force has decided to pay out bonuses to 600 police officers worth around £252. This is despite the Scottish Government deciding to suspend bonus payments in their new pay policy. And they are not the only ones. Managers at Scottish Enterprise got five-figure bonuses as part of a bonus pot for staff for 2009-10. The bonuses at Scottish Enterprise were handed out at a time when the quango was engaged in a £20 million efficiency drive that saw nearly 400 redundancies. We are often asked to comment on these payments and I remind people that these bonus payments, executive cars etc. were all introduced as part of a move to mirror private sector remuneration practice. There is no evidence that performance pay works anywhere and it certainly runs counter to public service values. At a time when services are being cut, this sort of practice undermines all our efforts to promote public services. Some senior managers need to wake up and recognise that fact. Today is International Human Rights Day. The date was chosen to honor the United Nations General Assembly's adoption and proclamation, on 10 December 1948, of the Universal Declaration of Human Rights (UDHR), the first global enunciation of human rights. from this came the European Convention on Human Rights (ECHR) and our UK and Scottish provisions. This year the United Nations calls on us to celebrate human rights defenders who act to end discrimination. These defenders speak out against discrimination, exclusion, oppression and violence. In Scotland, human rights defenders can be found in our local communities and in our public services. A wide range of public service staff are human rights defenders, striving to protect and promote the dignity of those they serve. Scotland's Human Rights Commissioner gives us some practical examples of applying human rights law in an article in today's Herald. “If someone is left in what amounts to degrading treatment, and cuts have been made without assessing the impact on their human rights, local authorities are likely to face challenges..... Public bodies need to be able to demonstrate that they have assessed the impact on vulnerable people in the community, that decision-making is proportionate and that individuals have been consulted. As awareness of the Human Rights Act increases, it is more likely that public authorities will be held to account and asked to justify that they were acting lawfully.” he said. Another group whose human rights are often abused are Scottish gypsy travellers. UNISON Scotland is planning to produce a guidance booklet aimed particular at our members who interface with this community. I have circulated a publication brief today inviting bids to undertake this work for us. If you might be interested and want a copy of the brief, please contact me. Human rights are also crucial to trade unions and EPSU are highlighting one such example today. Trade union leader Brother Carlo “Caloy” Rodriguez was assinated on 12 November 2010. He was the President of the Water District Union in the Laguna district of the Philippines. He was a strong advocate for the basic human and labour rights of the people and, in particular, against the privatisation of water services in the Philippines. On International Human Rights Day EPSU have asked for clarification about what the stance of the EU is with regards to the Right to Water. Legally, the Human Rights Council resolution of September 30th following the General Assembly Resolution makes the human right to water and sanitation legally binding on all EU Member States. They have suggested that the Commission publishes a clear position on how it intends to implement the human right to water and sanitation in Member States’ and EU policy and to mainstream this human right in all policies of the EU such as on Poverty and Development. The Cabinet Secretary for Finance today announced the Local Government Financial Settlement for 2011/12. Essentially this confirms the plan outlined in the draft Scottish budget. The needs based distribution formula remains unchanged. The settlement means a cut of 5.5% in real terms. Councils are given a classic Hobson’s choice. A cut of 2.6% if they accept the Government’s priorities, or a 6.4% cut if they don’t. If any council wanted to bridge the gap with a Council Tax rise they would need an increase of between 15% and 18%. Not an attractive political prospect for any council! This settlement will damage essential services and the local economy. It also heralds a return to ring fencing and a major attack on local democracy. Councils are being turned into the administrative arm of central government. A practical example of the impact is set out in a report in the Herald today on plans to cut care services. A survey of social work chiefs across the country reveals closing care homes and day centres, removing wardens from sheltered housing at weekends and creating waiting lists for homecare services are among the measures being taken to save cash. It also builds in massive waste such as police officers backfilling police civilian staffs at a huge cost to the taxpayer. Another example of waste is the reintroduction of PFI. The Commons spending watchdog reports today that banks charged an extra £1bn to fund new schools, hospitals and roads under private finance initiatives (PFI) schemes during the credit crunch – and the government failed in its duty to negotiate better deals. The main Scottish Government priority is the Council Tax freeze. This undermines local democracy and the shortfall is increasingly being made up by charges for services. This disproportionally hits low income households who rely on council services, yet it is the wealthiest who gain most from this real terms tax cut. The Council Tax freeze is simply not viable in the current financial climate. It supports wealthy homeowners at the expense of those who rely most on local services. The Scottish Government is keen to talk up this tax cut as part of its election strategy, but less keen to identify the services that will be cut to pay for it. The actual financial impact on local services will be greater than this allocation implies. Councils are already planning budget cuts and job losses over and above this grant settlement due to higher inflation, reducing income, rebuilding balances and demand for services in a recession. Overall, another dismal day for Scottish local government. The bad weather and the consequential cancelled meetings has at least enabled something of catch up on outstanding tasks. One of those tasks is a UNISON Scottish Pensions Bulletin on indexing of pensions. The UK Government has announced that it plans to index future pension benefits using the CPI instead of the RPI. The Scottish Public Pensions Agency is also planning to implement this in Scotland for local government by amending the LGPS regulations. The effect of the change is likely to result to a cut in pension benefits because the CPI is historically lower than the RPI. The CPI is generally 0.8% per annum less. The Hutton review calculated that this change could cut pension benefits by at least 15%. This change will impact on future pensions, but also retired members in receipt of public service pensions. This is the first time in recent years that a pension reform has cut benefits for those who have already completed their pension contributions. If this was a commercial contract you could sue the provider for breach of contract and we would regard the Scottish and UK governments as being in a similar breach. UNISON’s position is that the CPI is an inadequate measure of inflation and there should be a special index for pensions that is weighted on essential costs like energy, food and care cost increases. Debt is also an issue for pensioners, so interest rates are important for them as well. Equally the effect of interest rate cuts on the income of the retired should also be taken into account. At UK level the Government intends to use the Pensions Increase Act to enforce this cut in pension payments. Congratulations to John Robertson MP for highlighting this in EDM 1032 . There is a template letter on the UNISON UK website for anyone who wants to write to their MP on this issue. "We think that if the scheme rules say your pension is protected by the RPI then that should continue to be the case," Mr Webb told the World at One programme on BBC Radio 4. "Because we want people to have confidence and trust in their pensions we will not be re-writing the rules of their pension schemes. If you joined a pension scheme, [and] when you joined it the rules said that your pension would be protected by the RPI, and the scheme does not currently have the power to change its rules, we are not going to change that." Public sector schemes also make reference to the RPI. Confidence in them Minister? UNISON's Scottish Council meeting this morning, our regular gathering of branches across Scotland. UNISON's General Secretary, Dave Prentis addressed the meeting and took as his theme the Cinderella services, those public services that are essential to our communities but rarely get the attention they deserve. Everyone can identify the nurse, paramedic or refuse collector, but fewer recognise the staff that enable them to deliver their essential roles. We have always argued against the artificial frontline/back office divide that many politicians like to use. The delivery of public services is a team effort and the 'frontline' could not operate without a range of support services. In the main these services are in any case pretty lean. I was looking at a couple of reports this week that analysed the cost of administration in the emergency services and was struck by how low administration was as a proportion of total costs. Significantly lower than my experience of similar costs in the private sector. There was an interesting piece by Professor Richard Kerley in the latest edition of Holyrood magazine on this point. He questioned how efficient all the new systems that reduce admin and force operational staff to carry out functions that used to be done by admin staff. He used the example of 1970's TV cop dramas in which police officers are seen banging away with one finger on a typewriter. Ironically given the current Scottish Government policy we could be heading back that way. I call this displacement cost and I have seen it in the private sector when shared services are introduced. Tasks that used to be done by low paid clerical staff are replaced by a processing centre and online systems. The result is that vital time is taken up by 'frontline' staff to undertake these functions. They do it less well and at greater cost. The Finance Director may claim a big saving, but operational departments pay the real price. If we are taking a long look at public service reform, this is one area we need to review carefully. As an aside this was our Scottish Secretary, Matt Smith's last Scottish Council before he moves on to new challenges - he is very clear that he is not retiring. Good thing too, because Matt's contribution to the movement over some 37 years has been outstanding. We will miss him but I am sure he will continue to make an outstanding contribution to public service. The UK coalition government has introduced the Scotland Bill that implements most of the Calman Commission recommendations on extending the powers of the Scottish Parliament. The Bill will give new powers to allow the Scottish Parliament to set a new Scottish income tax from 2015, plus borrowing powers, worth £2.7bn, are to be devolved. Parliament will gain control over speed limit and drink-drive laws and control of air guns. There will also be Increased powers to run Holyrood elections. The new legislative powers are welcome although much less than UNISON argued for in our evidence to the Calman Commission. There remain a number of anomalies in the Scotland Act such as the Council Tax being devolved but Council Tax Benefit remaining reserved that the new Bill should have addressed. The principle of subsidiarity should apply to all powers that remain reserved to the UK Parliament. The big transfer of powers in this Bill is the tax raising provisions. It is of course right that the Scottish Parliament should be responsible for raising revenue as well as spending it. The 10p provisions are in principle right, although there are significant risks in devolving a variable yield tax without other revenue raising powers. The transitional provisions will be very important in this regard. The new borrowing powers are also important. It is very disappointing that these are to be devolved so slowly. It is entirely illogical that local government in Scotland can have prudential borrowing powers but that the Parliament itself does not. Borrowing powers would mean that the Scottish Parliament would have much greater scope in planning and funding efficient investment in Scottish public services. This would avoid having to rely on the discredited PFI methods which have been expensively used in the past and are now to be reinvented by the Scottish Government. The Bill also places limitations on the new powers and doesn't allow the Scottish Government to issue bonds. Something I believe would be particular appropriate for Scottish Water. Overall, whilst the Scotland Bill is to be welcomed, it is something of a missed opportunity. The product of a political compromise, when something more radical was required. I was giving evidence to the Scottish Parliament's Justice Committee today on the budget. Police boards face a real terms cut of at least six per cent and, as the Scottish Government say police numbers have to be maintained, the cuts will fall almost entirely on police (civilian) staff. Boards have correctly reported that, as a consequence, they will have to backfill civilian posts with police officers. Police staff deliver a wide range of routine, complex and specialised functions that are central to modern day police forces, while allowing uniformed officers to concentrate on operational policing duties. Maintaining an additional 1,000 police officers in this budget is a purely cosmetic political exercise. In practice, even more police officers will be taken off the street to perform tasks they are unsuited or unqualified to do - at a huge additional cost to the taxpayer. It would be a legitimate political objective to require 1000 additional operational staff on the street. But just to target police officers is economic madness. Many forces in Scotland are already way behind in the efficient deployment of police staffs. In England, 39% of police personnel are civilians (32% excluding PCSOs), while in Scotland it has fallen to 26.5%. The best forces in Scotland have modernised to these levels: Dumfries & Galloway has 33% while outdated Strathclyde can only manage 25%. This means that efficient forces like Dumfries & Galloway will be dragged down to the levels of the worst; like Strathclyde who have large numbers of police officers behind a desk rather than fighting crime. Last week in evidence to the Committee the Police Federation attacked the growth in HR staff. Well I would agree, in part. In Strathclyde Police the HR department used to have 6 police officers, now they have 13, not one of which has an HR qualification. The same force has 125 police officers in the control room. In the best forces all the control room staff are civilians trained to deliver this role. Focusing cuts on police staffs will have serious implications for policing across Scotland and it is vital that we protect the ability to deliver our frontline services, rather than score expensive political points. The Scottish Parliament's Economy, Energy and Tourism Committee (EET) announced today that they will recommend to the Parliament that the general principles of the Protection of Workers Bill are not agreed to. This was a majority decision led by SNP, Tory and Liberal-Democrat MSPs with Labour MSPs supporting the Bill. While the committee agreed with the Bill that ensuring protection of workers providing a service to the public is essential, and that something should be done now to tackle the problem of assault on workers and deter violence, most MSPs said this can be done without additional legislation. My initial media response was that nearly 30,000 public service workers subjected to recorded violent incidents last year will today feel badly let down by the majority of MSPs on the committee who reached this decision. They will be joined by many thousands of other workers subjected to violence in the workplace who need Parliament to take action to protect them. UNISON has always accepted that legislation is only part of the solution. But to argue that the current criminal law is adequate, when the prosecution authorities don’t even keep statistics, is a less than adequate response. We welcome the recommendations urging the prosecution authorities to take this issue more seriously, introduce new guidelines and to collect proper data. However, this has been identified as an issue over many years and little has happened. Meanwhile every year more workers are assaulted. We will obviously have to work harder to persuade MSP’s to reject this recommendation and approve the general principles of the Bill when it is debated in the chamber early next year. Parliament yesterday was completely dominated by the tax row as MSPs lined up to condemn John Swinney for not informing Parliament that tax-system payments had been withheld from HMRC. This makes the Scottish Variable Rate (SVR) of Income Tax uncollectable, even if anyone wanted to. Let me say, that in my book, John Swinney is the most competent minister in the Cabinet. Everyone, especially UNISON, give finance ministers a hard time even when times are good. John Swinney has the least enviable job in government at the present time, coupled with a huge portfolio of responsibilities - the minister for everything as he is known. Despite this he is a fair person to do business with, a skilled debater and I would certainly not question his integrity. On this occasion his defence that the money could have been used better, simply missed the point, and I think he realised that by the end of the debate. This is Parliament's power and it is not for any government, especially a minority one, to take away. But there is another point arising out of this political storm that hasn't been given any coverage. Whilst the Scottish Government may have had no intention of using the SVR, they did tell us that they wanted a Local Income Tax. More than that, they spent a lot of money working up their plans, issuing consultation papers and the like. A Local Income Tax would also need an up to date database of Scottish tax payers, a point we made during the consultation. I was always sceptical about the Government's real commitment to this change in local taxation. It always looked more like a political strategy to attack Labour over an unpopular tax. Now we know that they had no real intention to introduce a Local Income Tax. On the subject of the Council Tax I would recommend reading Professor David Bell's paper to the Finance committee on the budget and in particular the section (p10+) on who benefits from the Council Tax freeze. He makes the point that the freeze is neither fair or supports economic growth. A point reinforced yesterday when the Irish Government introduced a property tax for the first time. UNISON has always argued for a basket of taxation and that if we didn't have a property tax, we would probably have to invent one. Well the Irish have just found that out. David Bell's recommendation is "that the Finance Committee might consider whether the benefits of the council tax freeze outweigh its costs in terms of the services not delivered by local government or by other public bodies due to lack of funding." Absolutely spot on. This is Trade Union Week in the Scottish Parliament, an opportunity to showcase some of the work of the movement in Scotland and discuss current issues with MSPs. I was speaking at a lunchtime meeting on green workplaces chaired by Patrick Harvie MSP. I was able to highlight the work UNISON has been doing to promote green workplaces in Scotland. This includes a successful Climate Change Fund bid to develop green workplaces in South Lanarkshire Council. The project has only just started but there has been a good response from members. Thirty have already volunteered to become Green Champions. The strength of workplace greening is that it is much more likely to achieve the culture change we need than top down initiatives driven by employers. They should also transfer what they do into the home – a major source of greenhouse gas emissions. This led on to a discussion about what employers and government can do. The Scottish Government is consulting over statutory guidance to public bodies on how they should meet their public duty obligations under the Climate Change (S) Act. The current draft guidance is a good example of a traditional top down leadership model that rarely succeeds in making real change. At best it will be another tick box policy, or a plaque on the wall. In their negotiations over this year’s local government budget, CoSLA even sought to have their climate change obligations suspended. No real surprise, as they have sought to water down the commitment at every stage in the Bill’s progress. But it does indicate how far we still need to go to tackle climate change in Scotland. Published today my more detailed briefing and commentary on the Scottish Government's spending plans and draft budget for 2011-12. Having now worked my way through all 214 pages of the plan and most of the additional documents, my conclusions remain pretty much as I set out on the day. A poor hand dealt by the UK Government - but some poor choices made by John Swinney. The local government settlement is without doubt the worst piece of politics. We loudly applauded the Scottish Government for reducing ring fencing. However, they have now effectively returned to that approach and taken away any vestige of respect for local democracy. All because they think the Council Tax freeze is a political winner next year. Well no one likes to pay tax, but people understand that local services have to be paid for. This particular tax cut is also fundamentally unfair, as it favours the wealthiest home owners at the expense of the rest, who are paying increased charges for services. Then we have the wasteful expenditure. Police officer numbers maintained on paper, but in practice they will be pushing a desk, not patrolling our streets. Teachers doing the job of sacked classroom assistants and a new bonanza for management consultants. Then we have the return of PFI. The most expensive form of borrowing possible and another cash cow for the banks who got us into this mess. As expected there were some nasty surprises in the detail. A number of public bodies have pretty substantial cuts, well above the average, with no justification in the text. SEPA and Skills Development Scotland to name just two. Plenty of rhetoric about the low carbon economy, yet the energy budget gets a big cut. None of this should distract from the fact that the UK Con-Dem coalition are cutting spending too far, too fast, at a time when economic recovery remains fragile. However, within these constraints, the Scottish Government has made some poor decisions in this draft budget. UNISON Scotland ran a different type of training event last weekend. Mobilise 2010 was a campaign skills festival. Instead of a conventional campaign skills course the weekend included a wide range of skills workshops and participants could choose which modules to attend. They included conventional training on media skills, campaign organisation, lobbying etc to highly participative sessions on public speaking, political song and the use of film. The evening's brought together some of the skills into a social setting. Over a 100 activists and staff attended and the feedback was very positive. To get a flavour of the activities you can view films and photies on the Mobilise 2010 Facebook page. Full marks to those who chose to spend Saturday morning with me learning about public finance. Not the most exciting way to spend your weekend! The photie above is of the afternoon session on lobbying decision makers. Thanks to Pauline McNeil MSP for helping me out with this session. The Scottish Government has announced the membership and remit of its Commission on Public Services chaired by former STUC General Secretary, Campbell Christie. The remit is broad whilst recognising the ethos of public services in Scotland, or as the FM has described it, "The Commission will therefore examine various options for reform whilst retaining the social democratic ethos of our public service delivery in Scotland". Some of the vision points will be challenging, such as "are democratically accountable to the people of Scotland at both national and local levels". Local democratic accountability doesn't exist for most public services outwith councils and the two health boards that have the pilot direct election schemes. Having said that, this is hardly consistent with the draft budget proposals for local government that effectively reintroduce ring fencing and undermine local democracy. The membership is a fairly predictable balance of interests. The one rather obvious gap, so far, is anyone who actually delivers public services. The Chair wisely avoided getting drawn into the election and therefore the Commission will report in June. The Commission approach will no doubt be criticised by some. On the day Lord Young resigned we are duly warned of the shortcomings of the alternative approach. A pompous, opinionated individual, who made proposals on matters of life and death in health and safety law, without a scrap of evidence to support his findings. Give me a Commission with proper evidence procedures any day! It is a perfectly reasonable idea to ask a Commission to take a detailed look at Scotland's fairly complex public service organisation. My scepticism comes from long experience of public service reorganisation. They almost always cause organisational paralysis for a couple of years up to the change and then a further two years while the structures are established. They rarely achieve the promised service gains or financial savings. In the current financial crisis politicians talking about reorganisation is a tempting distraction technique from the impact of cuts in services. I was giving a presentation earlier this year to a visiting group of French business and union leaders. They expressed surprise at our Anglo-Saxon desire to constantly reorganise. After all, their key structures have hardly changed since Napoleon. I fear they may have the right approach. I was at the Politician of the Year awards last night and congratulations to all the winners. In particular to Hugh Henry MSP. His Audit Committee has demonstrated the strengths of the Scottish Parliament's committee system with their detailed scrutiny of government and civil servants. Not always comfortable for those giving evidence, but essential none the less. He went on to become the first backbencher to be named Scottish Politician of the Year. Not many in the room backed that result, but it was well deserved. Hugh was of course a minister in the last administration and what impressed me was the way he quickly adapted to opposition. When some of his colleagues were still thinking like ministers, Hugh was thinking up campaigns and making contact with civic Scotland to address issues of concern. A good example of that is his Protection of Workers Bill. I suspect some members of the committee may not grasp the issues as he has, but we will see. So after weeks of leaks and spin we finally got the Scottish Government's spending review today in Parliament. A one year budget to get them past the election next year, despite the UK CSR setting out spending plans for three years. £1.3m of spending cuts imposed by the UK Government next year growing to 3.3bn in real terms over the next three years. So called efficiency savings increasing to 3%. This is just a weak mask for cuts across the board in every department. A public sector pay freeze for those above £21k and £250 for those below. Even that concession is no where near inflation and constitutes a pay cut for the low paid. A continuation of the Council Tax freeze. A tax cut for wealthy home owners at the expense of services, jobs and increased charges for those who can least afford to pay. The reintroduction of PFI funded from revenue with all the associated costs. Years of cash wasted on the Scottish Futures Trust only to return to a failed policy. The total abrogation of local democracy with a finance settlement and services directed by the Scottish Government. That is unless any council takes the so called choice of a double digit Council Tax rise. One of those directed spending requirements is on police numbers. As a consequence we are likely to have even more police officers replacing civilian specialists instead of patrolling our streets. A couple of partial highlights. A commitment to no compulsory redundancy in return for 'flexibilities', although it remains to be seen if the Scottish Government can deliver this across the public sector. Plus the introduction of the Living Wage in the public sector, but no mention of extending the benefit to the private sector through procurement. When we do the detailed number crunching over the coming days I am sure we will find more smoke and mirrors as is normal in these spending reviews. The real villain here is of course the UK Con-Dem coalition and their ideological spending cuts. But the Scottish Government also had choices to make today. Sadly, they took some pretty bad ones. Excellent piece of investigative journalism by Tom Gordon in the Sunday Herald this morning. The Scottish Government are offering a staggering £250m of consultancy contracts at the same time as cutting public services and imposing a pay freeze on public service workers. Whilst I accept the constraints imposed by the Con-Dem coalition's slash and burn approach to public services, the Scottish Government still has choices to make. One of the areas of waste UNISON has highlighted many times is spending on consultants. For example we published the result of an FoI survey of contracts awarded to KPMG. Always the first to claim they can cut costs, however, they have no compunction about accept millions of pounds of taxpayers cash. Management consultants rarely offer anything new. They sell the latest fad and most of those are simply a reworking of old ideas. 15 years ago they told us we should decentralise support services. Now they say we should centralise. Of course they always dream up a new name - this time they call it shared services. John Swinney's article in today's Scotland on Sunday talks about hard choices to be made. Actually John, this is the easiest decision you will have to make - scrap the consultants. According to the large number of media enquiries today the Scottish Government is briefing that they intend to announce a pay freeze alongside the spending review next week. Of course the Scottish Government does not directly control the pay of the vast majority of public service workers in Scotland. Any more than they control job losses, so any linkage is tangential at best. They also appear to be briefing that public sector workers will benefit from their council tax freeze. This is particularly galling when the biggest gainers from this real terms tax cut are the wealthiest home owners. Not many of our members in that category! What our members and other low paid workers do have to pay is increased charges for the council services they rely on, because that is how most councils are plugging the financial gap. The Government is keen to talk up the tax freeze, but less keen to talk about the services that will be cut to pay for it and the consequential job losses. Part of this pay freeze is to pay for a shift in revenue to capital expenditure, in a claimed boost for jobs. What the Government forgets is that low paid workers spend almost all their earnings in the local economy. Capital expenditure is not nearly as efficient in creating jobs because the benefit leaks away in company profits and dividends, not to mention out of Scotland. The CBI has, not surprisingly, been busy lobbying for this shift. Company Directors will be amongst the biggest gainers and are the first to call for wage cuts in the public sector. This means they can award themselves the 55% pay increases reported last week. It is also an issue of basic fairness. Many, including the Scottish Government, have rightly criticised the UK Government CSR announcement as unfair, hitting hardest those least able to bear it. Well a Scottish pay freeze is also unfair. Low paid workers providing public services face increased pension contributions, housing benefit cuts and increasing inflation on essential goods like food. That all adds up, not to a pay freeze, but a very real cut in living standards. Nobody in the public sector is expecting substantial pay rises in the coming year. But most of the workers who deliver public services in Scotland are low paid and a pay freeze is not only unfair, but will damage the Scottish economy. Up early this morning for a BBC Radio debate on the Scottish Water Bill. The Scottish Government got itself into a muddle over the Bill. First it was going to go straight for legislation and now it is going for the more normal consultation route. Whatever the reasons for the muddle, it gave MSPs an opportunity to poke fun at the minister in parliament yesterday. My main point in this morning's debate was that whilst yesterday's muddle might make good political theatre, we now expect our parliamentarians to raise their game and see the bigger picture. The aim of the Bill remains to keep Scottish Water in public ownership, but to allow the utility to expand its operations and engage in wider activities such as renewable energy projects. It also provides an opportunity to promote a wider vision of water resources. We particularly welcomed the Minister’s commitment to retain the control of Scottish Water in public ownership. Scottish Labour articulated a similar vision in its policy programme agreed at Oban recently so we at least have a shared vision across a large parliamentary majority. The long term vision is that Scotland’s water is much more than the provision of a utility. It is a vital economic asset that will become even more important in the years to come. If the 20th Century was dominated by oil, then the 21st Century will be dominated by water provision. Wet countries like Scotland are well placed to exploit the economic and environmental opportunities. Not an easy concept to sell on a typically wet and windy November day in Scotland! Jeremy Purvis MSP for Liberals used the budget crisis and the concept of mutualisation as cover for their privatisation policy. I would expect the Tories to support privatisation but I am lost as to why the Liberals have joined them. The much quoted Welsh Water is not a real mutual. It is a cosmetic cover for the private water companies that actually deliver water services in Wales. Much emphasis is placed on the £140m of government financing for capital in the current financial difficulties. Less well known is the fact that £90m is returned through loan repayment. None of this would be necessary if Scottish Water had prudential borrowing powers. The implementation of the Calman recommendations or the relaxation of Treasury budget guidance could achieve this. I suggested to Jeremy that he might like to ask his pal Danny Alexander MP to facilitate this now. We expect the usual vested interests to use the Bill consultation to yet again argue the case for privatisation/mutualisation. This would involve selling off assets paid for by the taxpayer over many years at a fraction of its true value. We would be selling off huge swathes of Scotland, almost certainly to foreign interests, together with the opportunity to exploit Scotland’s water potential for the benefit of big business rather than the people. Charge payers would face higher bills to pay for the purchase debt, fees and directors salaries.When communities across the world are reclaiming their water, it would be crazy for Scotland to abandon our greatest asset. UNISON Scotland regards the Bill consultation as an important step towards a broader approach to water in Scotland. The current approach of the Scottish Water Board and the regulatory framework can act as barrier to this larger vision for Scotland’s water. Scotland needs a democratically accountable, strategic approach to water that is broader than simply providing a utility, important though that is. We can be the Scottish Government's sternest critic on many issues. But apart from the process muddle, they have the direction and vision right on this one. For politicians there are only two positions in this debate. You share a long term vision for a public water service or you want to sell off our greatest asset. Your choice, but I am confident the people of Scotland will recognise those who have the big vision over the short term privatisers. Today is Remembrance Day. The time of the year when by the wearing of a simple emblem, a red poppy, we salute the memory of those who sacrificed their health, their strength, even their lives, that we might live in a free country. In remembering those who sacrificed so much we should also remind people how the British National Party has repeatedly sided with the Nazis and believed it was wrong that Britain went to war with Germany. Only this August Adam Walker, a leading BNP officer, attended an international far-right gathering in Japan hosted by Issuikai, a right-wing association that denies Japanese war crimes. While there he visited the Yasukuni Shrine to commemorate the Japanese war dead and excused their actions by claiming they "were doing what they thought was right at the time". This is typical of the BNP whose leaders have repeatedly praised the Waffen SS. Holocaust deniers are regular speakers at BNP events. With communities facing huge reductions in public services over the coming year there is a real danger that the BNP will try to exploit the unease and economic difficulties these spending cuts will cause. That is why it is even more important we tell the truth about the BNP. "The Nazis wanted to rule over us, but they couldn't," remembers Doris. "People have short memories and the young do not know what we went through, but anyone who lived through the war would never want to vote for the BNP. Nazis should not be allowed to rule anywhere, they must be guarded against, surely everyone must know that." Like Doris, but unlike the BNP, decent people in Scotland remember those who sacrificed so much to rid Europe of Nazism. That is why we campaign against the BNP. A number of examples today of how the so called 'Big Society' is all rhetoric and no action. The closure of Citizens Advice Bureau (CAB) offices due to council cuts illustrates the link between public spending cuts and the voluntary sector. Many hundreds of charities dependent on Government funding have agreements which expire in March next year. At the same time they face public funding cuts, other sources of income for the sector are coming to an end. Individual donations are falling as the public tighten their belts and many grant-giving trusts are struggling as investments stagnate. Even the Archbishop of Canterbury has warned that the Big Society concept has not been properly thought through. The Institute for Public Policy Research warns that the funding cliff edge will “undermine the potential of voluntary groups to fulfil the Coalition Government’s Big Society plans”. The New Economics Foundation, report 'Cutting It' goes further. It says, the scale and speed of the cuts leave civic society with “an impossible job to do." I see that even UK government ministers are struggling with the concept. Delivering a speech to volunteering organisation CSV, the children's minister said: "The trouble is that most people don't know what the Big Society really means, least of all the unfortunate ministers who have to articulate it." Ed Miliband got it just about right when he said the Tories were "cynically attempting to dignify its cuts agenda, by dressing up the withdrawal of support with the language of reinvigorating civic society." A really welcome announcement today of the establishment of a High Pay Commission set up by Compass with the support of the Joseph Rowntree Charitable Trust. It is chaired by Deborah Hargreaves, a highly regarded former business editor of the Financial Times, and now launched it will run independently from Compass. Deborah is joined by a panel of five Commissioners from business, academia and the trade unions. The recent IDS survey showing 55% pay increases for FTSE 100 Directors has ignited the public debate around issues of high pay. New polling to mark the launch shows that 85% of people think top executives are overpaid. Only 9% of people realise just how high executive pay is and how out of touch it has become with workers pay in recent years. More than 200 times the average worker. The Commission has a website and is inviting evidence. The Stop Climate Chaos Coalition is calling on people across the UK to connect with other people in their communities on the 5th or 6th of November and lobby their MPs. SCCS is Scotland's biggest member coalition representing nearly 2 million Scots calling for action on climate change. The world needs a global solution to climate change delivered by a fair, ambitious and binding agreement under the United Nations. The UK should deliver real leadership: leading by example to deliver on a low carbon economy at home, and leading in the global negotiations to push for richer countries to provide support for action in developing countries. In the next few months there are two key opportunities for MPs to influence the global and domestic climate change agenda: the Energy Security and Green Economy Bill and the UN Climate Conference in Cancun. In the Energy Security and Green Economy Bill, introduce enabling legislation so a strong Emissions Performance Standard (EPS) for fossil fuel power stations can be set to enable delivery of a decarbonised electricity supply by 2030. At the Cancun International Climate talks in December the UK should support the establishment of one common climate fund to help developing countries adapt to climate change, develop in a low carbon way and protect their forests. The UK should also champion innovative sources of public climate finance and guarantee that UK money for adaptation in developing countries will be provided as grants rather than loans. Lots of materials to support the Big Climate Connection can be viewed at the SCCS website. And on the subject of climate change please support stronger duties on public bodies. Scotland has tough targets to reduce greenhouse gas emissions and our local authorities and other public bodies have a major part to play in achieving these targets. Thanks to campaigning by UNISON and others in Stop Climate Chaos Scotland, public bodies have statutory duties under the Climate Change (Scotland) Act 2009. Yet the Scottish Government does not plan to require public bodies to report on what they are actually doing to reduce emissions – making it difficult to monitor their performance and therefore their overall progress. You can respond to the current consultation through our Green Workplaces page. I spent today at a seminar looking at how to improve public services. There are many of these events in Scotland at present and most are just a platform for the outsourcing providers and management consultants to pitch to the public sector. Whilst there was an element of that at this seminar, the speakers and the debate was much more balanced than others I have been at. My presentation aimed to give a reality check to some of the main proposals for improving public services. First and foremost there is the financial position. This will restrict the ability to innovate as many schemes require spending to make eventual savings. The 40% cut in capital is also being used as an excuse to privatise, with the contractor providing the capital investment. What is often forgotten is that this has to be paid for from the revenue budget, at far greater cost than local authority borrowing. There is a real risk that we end up wasting similar amounts of taxpayer pounds as happened with PFI. Outsourcing is back on the agenda with a range of doubtful claims being made for potential savings. A new breed of officials who weren't around during the 1980's CCT and market testing period will need to relearn the lessons of that period. Contractors will almost always cost to the margin and make their profits through variation orders and corner cutting. The Edinburgh trams are all over the media this morning and that is a classic example of this contractor strategy. I used Liverpool Direct as my case study. A recent audit report of this flagship Joint Venture reported that the council could save £23m p.a. by taking the work back in-house. Shared services in principle is a good idea. However, in practice the promised savings rarely materialise and costs are often shunted to operational functions. Contact centres can work for simple transactions but are not always suitable for the complexity of public service provision. Service redesign is always best done in partnership with the staff who actually deliver the service. If job security is guaranteed under an organisational change agreement, then staff are more willing to innovate and there are many examples of real service improvement using this model. It's also a lot cheaper than the £2.8bn wasted each year by the public sector on management consultants! Day 3 and the weather breaks to remind us what a beautiful place Oban harbour is. Traditionally this is the quiet final morning, although the attendance first thing clearly benefited from the clocks being turned back! The main debate was the economy and skills. Brilliantly led off by Richard Leonard with his usual balance of history and radical vision. Good contributions from the floor including UNISON's Edwina Phillips, a front line careers advisor, setting out what life is like for job seeking young people in the current economic climate. I was asked to give the vote of thanks. So many people work hard to ensure a conference of this size runs smoothly and we should give them full credit. I tried to resist rodent jokes after Harriet Harman's outburst - but failed! Too tempting. But it was an opportunity to point out that this was the conference when the New Labour brand was finally binned. Not before time. Although as one supporter of the ideology pointed out to me - In Scottish Labour the brand never really reached any further than the notepaper. More importantly party leaders and speakers showed at this conference that substance is more important than spin and Labour values beat market values every time. Overall this was one of the best Scottish Labour conferences I have attended. Always good to meet old comrades, but as in the UNISON delegation, there were plenty of first time delegates. That is a good sign for the future. Day 2 in Oban and with the ongoing weather I discover why the label on my suit says 'dry clean only'! The morning session featured the debate on UNISON's contemporary motion on public services and the CSR. It sets out an alternative economic strategy and puts Scottish Labour firmly on the side of the vast majority of Scots who oppose the Con-Dems ideological attack on public service provision. The debate on reserved issues included a strong speech from our young member's delegate, Keiron Green. He outlined the impact on his school and the wider community in Moray of the planned air base closures. This was followed by the debate on Education with Pat Rowland highlighting the importance of nursery education. More action and less glossy documents was her message to the Scottish Government. The afternoon session started with Iain Gray's speech. This was full of substance with the theme being that in tough times you have to make hard choices, but those choices will be driven by Scottish Labour values. Iain is often characterised as the grey man. Nothing of that today. It was a thoughtful speech with several important announcements, light on spin, strong on values and he showed that he can be passionate about what matters. The day ended with the health debate kicked off by UNISON's Katrina Murray. There were good local examples of health and social care challenges from UNISON delegates including Morag Houston, Matt McLaughlin and Alan Cowan. The proposed National Care Service deserves serious consideration at a time when social care procurement is driving a race to the bottom in standards through privatisation. It was good to hear Iain Gray and Jackie Baillie both acknowledge this in their speeches. There was a good buzz around the fringe. We had a lively discussion at our joint lunchtime event with APSE on how councils should respond to the financial situation. In the evening delegates were very positive about conference. At the trade union reception both Iain Gray and Ann McKechin's contributions showed a good grasp of the issues of concern to workers. Our Workplace Agenda features strongly in the policy programme agreed at conference this weekend. Day 1 at the Scottish Labour Party conference in a very wet and windy Oban. The day started with a debate on justice policy. I got up to second a motion supporting Hugh Henry's Protection of Workers Bill. This was an opportunity to highlight our recent survey that revealed nearly 30,000 recorded violent incidents in Scotland's public sector. Effective legislation is part of the solution but the Scottish Government claims the Bill is not necessary because the common law provisions are working well. However, they can produce no evidence to support this claim and our experience is that the system is not protecting our members. Staff who serve the public are entitled to better protection from the justice system. George McIrvine from our Police Committee made a thoughtful contribution on police cuts. He set out the roles Police Staffs undertake and highlighted the waste of deploying police officers in administrative roles. Extra police officers are useless if they are sitting behind a desk performing functions they are not qualified to do. The keynote speech of the day was UK Leader Ed Milliband MP. Ed gave an excellent performance that set out a new direction for Labour under his leadership, a clear break from New Labour. Incidentally the New Labour brand name is being excised from Scottish Labour publications - not that the ideology ever really caught on here. More importantly he set out an alternative economic strategy to the Con-Dem coalition. Iain Gray launched the Living Wage campaign with a commitment to a wage of at least £7.15 per hour across the public sector. He also understands the importance of using public sector procurement to achieve a living wage in the private sector as well. Less welcome was talk of pay freezes. We recognise that money will be tight next year but expecting low paid workers to meet the cost of the bankers folly does not meet any measure of fairness that I know of. The local government debate began with CoSLA Labour Leader Jim McCabe dismissing the Concordat. He described the recent negotiations with John Swinney as deceitful. As usual Jim rarely misses his mark! Gray Allen from our Falkirk Branch made an entertaining contribution, giving a front line workers perspective of the Con-Dem attack on local services. Our lunch time fringe meeting on climate change was well attended, despite the rain. Some excellent presentations and thoughtful contributions from the floor promoting the Stop Climate Chaos Scotland manifesto. Many of these proposals appear in the Scottish Labour policy programme and Iain Gray and Sarah Boyack both paid credit to the effectiveness of the SCCS lobby on the Climate Change Act. More evidence of corporate greed this morning in the latest IDS survey of top bosses pay. The report shows basic pay for FTSE 100 chief executives rose by 3.6 per cent in the year to June. But that was topped up with bonuses, share awards and performance-related payments. Blue-chip bosses enjoyed average bonuses of more than £700,000, up 34 per cent on the previous year, bringing the average total remuneration package to £4.9million. They already earn more than 200 times the average wage. These are the very same people who write letters to the press urging cuts in public spending and the consequential pay freezes and increases in pension contributions for the low paid. The one thing these bosses do really well is hypocrisy! I am often asked in media interviews what our members reaction is to likely pay freezes next year. Our members recognise that money will be very tight but they get really angry when the bankers who got us into this mess are preparing to pay themselves bonuses of up to £7bn. That's twice the likely cut in total public expenditure in Scotland over the next four years. With fair taxation and clamping down on tax avoidance we could more than wipe out the deficit. All in this together? I think not! Today is National Inspection Day, part of the European Health and Safety Week, when all Safety Representatives are asked to inspect their workplaces. UNISON Scotland has over 4000 Safety Representatives, so that should be a lot of inspection activity leading to safer workplaces. The TUC has published a handy quick guide to inspections and a poster. This year's campaign day is all the more important due to the the report produced by Lord Young attacking the very basis of workplace safety. We did not vote to die at work and this report will not reduce workplace illness, injury or death. Nearly 1,500 workers are killed in work-related incidents, up to 50,000 more due to work-related illness, and millions suffer ill-health at work every year. Proportionally more in Scotland than in the rest of the UK. Far from health and safety being a burden on business, it is a positive bonus to employers as the best fully understand. The real burden of poor health and safety in terms of injury, illness and death is massive and is borne mainly by workers, their families and the state in benefits and health care costs. There are far too few inspections and they are likely to get fewer with 35% cuts announced for the HSE in the UK spending review. Excellent turn out on Saturday for the Better Way demonstration and rally in Edinburgh. We may not have the resources of the big business lobby but we do have the people. 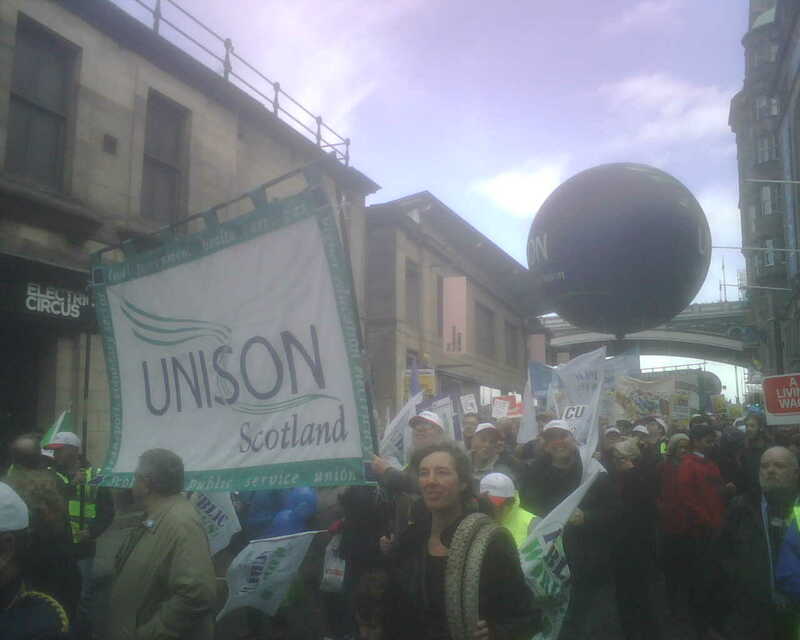 Thousands of people from trade unions, faith and community organisations marching along Princes Street to shout that there is an alternative to cuts and economic misery. There was a particularly strong turnout from UNISON branches. Members came from all over Scotland, many having an early start to get there. Events like this are important milestones in the campaign and they are valuable in building solidarity. That's our real strength and we are going to need all of that strength in the months ahead. I was speaking at our health and safety seminar today. An annual gathering of safety representatives to update them on current developments and to agree priorities for the coming year. We used the seminar to launch our annual survey of violence at work in Scotland. Sadly the survey revealed an increase of over 3000 assaults when compared with last year, with more than 28,000 assaults on staff recorded for the year 2009-10. Any act of violence on a member of staff going about their business of providing vital public services is completely unacceptable. To have over 28,000 in a year is shocking, especially when these are just the recorded incidents. This shows that many employers, particularly in local government, have to do more to protect their staff. Where rigorous monitoring and active preventative measures are in place, this has resulted in improvements for the health and safety of our members. But some employers are clearly failing to monitor violent assaults effectively, and as a result are failing to do enough to protect their staff. We had one council who couldn't find their figures and others that could only produce long lists of incidents that they clearly haven't analysed. The Scottish Centre for Healthy Working Lives published guidelines in February titled “Managing Occupational Violence in the Workplace”. Not enough councils have reviewed their policies to reflect that guidance. These figures also emphasise the need for the Protection of Workers (Scotland) Bill introduced by Hugh Henry MSP. In light of the CSR I would recommend reading Joseph Stiglitz's comment piece in the Guardian earler this week. Probably the most credible economist in the world saying that the UK economy needs a stimulus, not the deficit reduction slash and burn we got yesterday. "Britain is embarking on a highly risky experiment. More likely than not, it will add one more data point to the well- established result that austerity in the midst of a downturn lowers GDP and increases unemployment, and excessive austerity can have long-lasting effects. If Britain were wealthier, or if the prospects of success were greater, it might be a risk worth taking. But it is a gamble with almost no potential upside. Austerity is a gamble which Britain can ill afford." The Nobel prize winning economist has agreed to join the Scottish Government's Council of Economic Advisors. He is a massive improvement on the current Chair of that group Sir George Mathewson, arguably one of the authors of the banking collapse, and certainly a man with little credibility left. George Osborne's CSR announcement was every bit as bad as we expected. A clear ideological drive to cut public services, using the budget deficit as a smokescreen. The principles are apparently fairness, reform and growth. It doesn't look fair when the poorest in society will be the hardest hit by cuts in services and welfare benefits. The bankers bonuses are barely scratched and corporate tax dodging goes unpunished. How taking half a million workers away from services is going to 'improve' them, remained unexplained by the Chancellor. It was all classic spin. Announce huge cuts then offer a few sweeties to sugar the pill. In Scotland the Barnett consequentials are every bit as serious as expected. In practice the impact will be greater because councils and health boards have additional costs over and above these allocations. Councils and health boards have to live in the real world where inflation is more than double the nominal Treasury assumption. We calculate that some 60,000 public sector and 65,000 private sector jobs could go in Scotland because of these cuts, They could cost the Treasury around £500m in lost tax revenue and £640m in increased benefit payments - adding to the annual deficit and almost entirely canceling out the saving to the public sector pay-bill. For those public sector workers who stay in employment they face a pay freeze and a 3% increase in pension contributions. This at a time when their pension benefits will be cut by 15% as a consequence of the proposed shift of the uprating index from RPI to CPI. Now that is a double whammy!